What if Harold had won at Hastings; if Napoleon had not turned his attention to the Russian front? What if someone had appreciated Adolf Hitler’s art before he began to cast around for more political pursuits? On one day, in one instant, something happened to divert reality so that Harold ended up with that fateful arrow, and Napoleon ended his days being poisoned by the arsenic in his wallpaper. And Adolf never became a famous artist. What happened , happened. It is set in stone. Yet this does not stop us doodling whimsically in our literature. The great science fiction writers of the late nineteenth century have caused a sort of doubleback loop, a strange junction in our ‘what if?’ fantasies. Jules Verne, HG Wells, and the earlier fantasy, Mary Shelley’s Frankenstein: they all took the newest technology, and then grafted fantasy onto its iron limbs. Their very novels were veritable monsters bolted together so expertly that a new, eerie life coursed through them, not so much like blood, but more akin to an electric current. Yet those were the days before plastic, and fast food: before diesel trains and flick-switch electric light. They were the days before the great tide of scientific advances became merely modern conveniences. What if those advances had never been made? In the 1980s there rose up a genre from its dais, sewn together from pieces as diverse as the gothic novel, science fiction and horror. And it was a sci-fi author, KW Jeter, who named it first: steampunk. Steampunk brings the ‘what if’ paradigm to all the diverse inventions of what we in England call the Victorian era. The engineers and their pistons are taken to territory they never trod, steam creations become outrageously lavish. The clothes are all boot-buttons and bodices, the buildings towering creations of glass and iron, those glorious materials tamed by our 19th century forebears. Iron and glass, iron and glass. I was wandering round Kew Gardens, Richmond, taking the air. It is full of glasshouses, towering and monumental. I knew what I was looking for. I was looking for something steampunk. 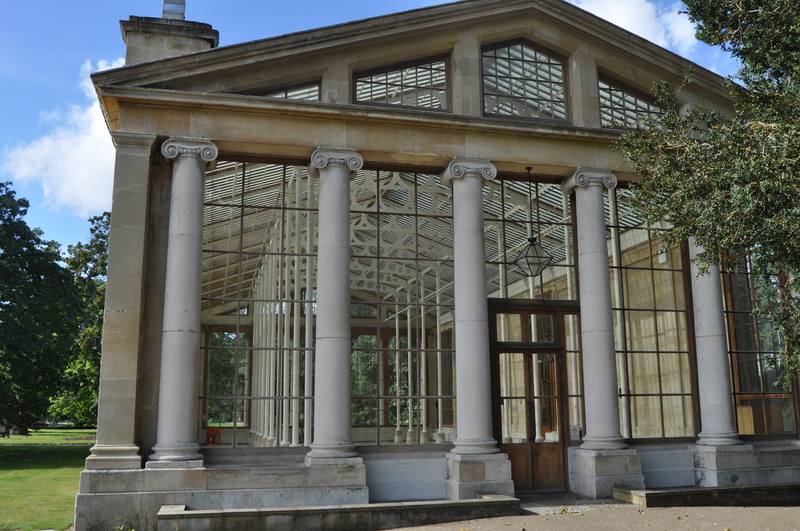 I wandered past the Nash conservatory, a classical early Victorian conservatory. Gorgeous, filled with light: but there was nothing wayward or slightly naughty about this building. I strolled on. After a while I hit on the Princess of Wales conservatory. It is home to ten climate zones, but opened in 1982 it has more of the Valley Forge from Silent Running about it. Sci-fi, white and seventies, but with none of that earthy iron ornate tartiness which draws one inexorably into the steampunk lair. The Palm House: a steampunk author’s dream. Built by the satisfyingly named Decimus Burton, the glass and iron cathedral design borrowed heavily from shipbuilding technology of the time. The Palm House is said to be modelled on the structure of an upturned ship’s hull. To see her is to adore her. For she combines utilitarian requirements – the housing of rare and exotic rain forest species, and the maintenance of its environment – with whimsical design wrought in iron. She is everything that is ‘what if?’. Once upon a time, someone asked the question and the magnificent structure- the foremost glass and iron structure in the world – was born. If you ever get the chance: walk through her tall imposing doors and climb the spiral staircase to walk above the plants. For here is seductive geometry to rival the airship. It is infinitely pleasing to the eye, all green-tinted light and white filigree: but iron-strong. It is the beginning of a steampunk novel if ever I spied one. 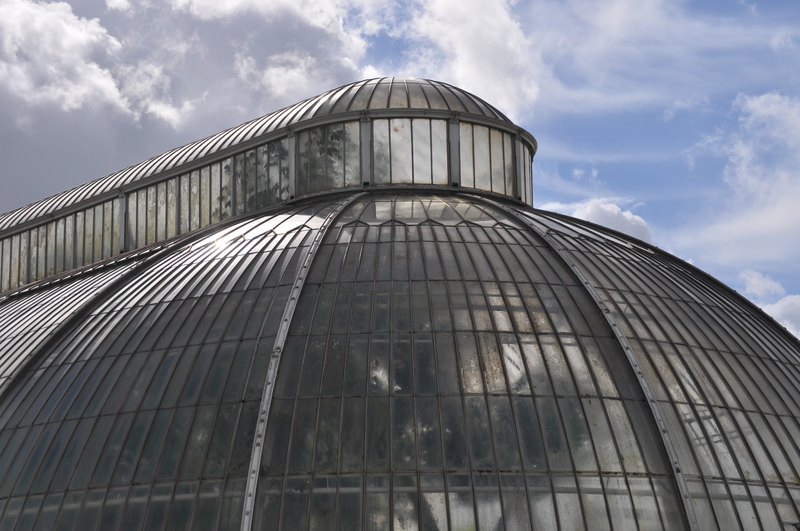 Posted in London, Places to visitTagged Kew Gardens, palm house, steampunk, VictorianBookmark the permalink. Wow that’s beautiful and as an avid steampunk fan I can really appreciate it! Thank you. I think you have every right to be! And miss out on the fun? You are welcome, Marco: it gets me every time…. You’re right, this is a magnificent structure that is perversely hip in the modern world. I love the lush plant life within. oooh I want it. Please can I move into a tiny cottage attached to it? Better still, make me wealthy enough to have extensive grounds with my own and an army of gardeners. The Princess of Wales one is really rather too utilitarian and doesn’t seem to take the imagination soaring. Its a pity the Nash one is not in use. 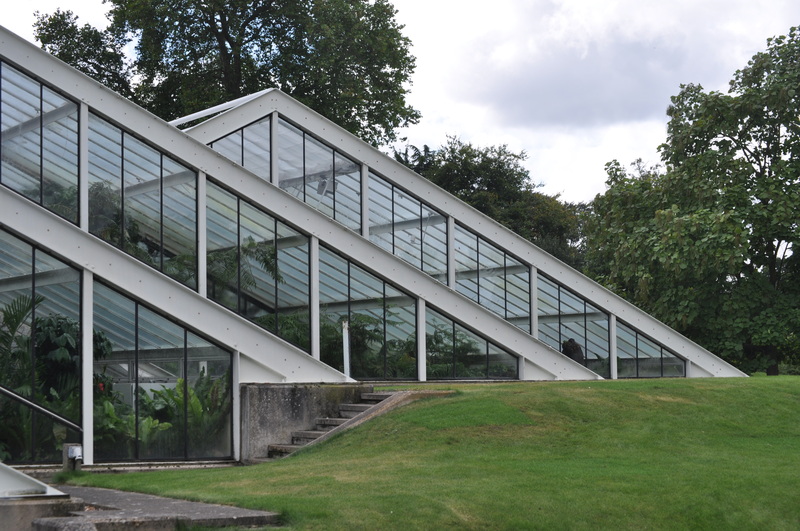 I agree…the Nash one is the first glasshouse past the entrance and it is rather classically beautiful. A tiny cottage attached to the Palm House. What a superb idea. I love steampunk, and you’re right. This is the perfect place to let the stampunk muse lose. Thanks for sharing the pictures, which I’m sure, will inspire someone write something wonderful. Let us hope so, Barb! 😀 Aw, Not an easy place to be frozen, Roger! What an exciting word, steampunk. I’ve never come across it before. And the building is definitely steampunk. Loved it. It’s a very exotic idea, really, Banno. Glad you loved The Palm House: it’s one of my favourites. This used to be one of my most magical places. As I child we lived not too far away and often we would go and wander in the grounds. Access to the hot house was not always available due to renovation, so this vast glass creation would seem to smirk and say ‘Not today’. Being able to walk above and look down is an amazing sight. Thanks again for a reminder. It used to cost 1 whole penny to enter the gardens, then at decimalisation it became 10p if memory serves me correctly. . I bet it costs more now. fondly remember the fortnight i spent just steps from kew during my extended london sojourn… and into renewed focus: steampunk! It is a wonderful place from which to conduct a tour of London and England, Sabonseine. But it’s a heck of a good one, Col! Sums the whole thing up, really! It is and does, and has taught me that ‘punk’ had origins WAY before I would have thought. Very cool pics and once again I have become enlightened by your crafty writing. 🙂 Lou, it’s a must-see on your next trip over! HG Wells a fav author of my childhood. Liked Edgar Rice Burroughs, Arthur Conan Doyle and James Fennimore Cooper too. Ernie Pyle wrote great children’s books too. He’s a favourite of mine, too, Carl, and we love to listen to The Time Machine and The First Men In The Moon and suchlike for our nighttime audiobook. I love this! Your pictures are phenomenal, Kate, and I once again am yearning for Kew. Can’t you just imagine the stories that could be told here? I would adore her, as you say. I do adore here from my perch here. Thank you for making my day. Penny, I could not wait to show you Kew. One day I’d love to walk it with you. Even now, when the flowers are fading, it is filled with event. What a treasure. I love the lines of that metal and glass. It is one of those audacious buildings that always capture my imagination. It is totally audacious, what a perfect word. Very naughty. oh, marvelous. like shivers up my arms marvelous. I always enjoy your pictures of architectural details. Beautiful shots and sights, Kate. I believe I’ve seen those spiral stairs before . . . perhaps on Martin’s site (Tales from Finchley)? Clever Martin: I love his photos…..thank you. Nancy! I must catch that episode, Carrie! I’ve never heard of steampunk before, but it seems I’ve loved it all along without knowing what it was called. No steampunk here in Hawaii, but now all the steampunk creations I’ve seen on my travels are rattling through my brain, to my great pleasure. I love your connection from Mary Shelley’s Frankenstein to the steampunk creations of iron and glass. The greenery really softens the image – just gorgeous. Thanks for the insights you provide. Pleasure, Judy you’re right, the plants soften it so well. Steampunk – such a perfect word. Have you read any of the Moral Engine books yet? I suspect that you’ll love them. It was designed to dazzle, I am sure, Debra! Great to see your shots from Kew. We very nearly met in cyberspace this week 🙂 I too was contemplating a post about Kew for the K story challenge. In the end Kings Cross won the toss! I cannot budge the image of Napoleon licking his wallpaper, Martin 😀 I know the HIstorian very well indeed and love it to bits. Just such a compelling read! Lke travelling to those paces yourself…must re-read it! Steampunk is awesome. Have you seen photos of peoples houses where they have converted the insides to steampunk. Complete with brass and copper keyboards. Simply brilliant. If you grew up on Jules Verne science fiction, you cannot fail to love steampunk. I love it 🙂 Verne is one of my top authors, along with Wells of course. Must look up some of those houses you mention! Steampunk. What a great word. I’m not sure I understand all I know about it, but i love saying it. Steampunk. Steampunk. Thanks for the great photos anf the enlightenment.